My new runner is beautiful with the cabinet. :o) I know Ulla loved her runner too. Your stitching pattern is perfect. I know these were gifts from the heart. Beautiful quilting on those runners, Candace. I had visited Stephanie this morning and already commented on wonderful the taberunner is. Candace, you are too kind. Such a beautiful tablerunner for such a dear, kind person. And I'm sure Ulla is just as pleased and overjoyed at her thoughtful gift. Love love love the runner you made for Stephanie, and the string runner is adorable as is the tea towel and little bag. Terrific secrets well kept. Wow, Candace, you have been making some fabulous secret projects. I just came from Stephanie's blog. The table runner is so her. 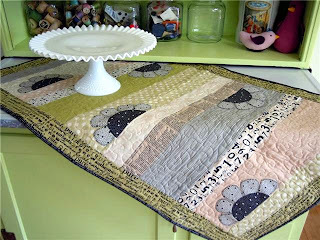 I really like the quilting you did on Ulla's runner. Great job. The towels are so sweet too. I know they will both treasure them for years to come. Hey, me too! Secret secrets. It is fun to have a reveal. Your projects are darling. Love them. Good good work. The runner is wonderful - it's perfect with Stephanie's cabinet. Giving is so much fun - way to go, Candace. I've just come back from Stephanie's blog, and I'm sure she loved her gifts as much as I loved mine. I can hardly believe you had never done the freehand stitching swirls before; they are just perfect. Thank you and Mr. Squash once again from both of us! You're teasing us about the new project but I'm loving it! I'm excited to see what you've done. Love the table runner and the bag is too dang cute too. I was just on Stephanies's blog. I love your runner, love the colors and the half flowers. You are right it fits so well in her home. I know how happy we feel when we do and give something to someone for no other reason than to say "thought of you"
You have wonderful taste in color and fabrics, love the no strings project and the quilting, stunning!! Love that swirly quilting on the runner. I clicked and enlarged the picture to follow the design as I want to try it. Also have printed off the little bag instructions to make. Would appreciate the little hints you mentioned that would help in construction. The runners are beautiful. And your swirling quilting is very nice! I don't know if I will ever get beyond geometric quilting. I love that table runner, was it a kit or is there a pattern? I love that fabric! The table runner is so gorgeous!I love your color and fabric choices... very subtle yet very stunning! The table runner is very pretty. And so is the embroidered tea towel. Embroidery seems to have made a comeback. I am doing a little myself. Lovely gifts received by friends and more to come ~ whew! Yes I can believe that you are working on more secret projects. :-D Now that you've settled in your new home you area a whirlwind of creativity. Plenty of baking and fun outings with friends, too. This is what retirement is supposed to be like. Wonderful! Superb job Candice! I love your swirls!! True treasures!! Both projects are just wonderful! I LOVE your swirls and they're perfect to offset the straight lines of the table runner. Can't wait to see what you and Mr. Squash have been working on. Love all the projects. That secret stuff is fun isn't it? Love everything! And Candace, I appreciate your kindness each and every day ...I can always find my rulers now, thanks to your thoughtful gift! What lovely gifts you have made for your friends! All the kindness you give will come back to you! Such pretty tablerunners. There are some lucky receipients out there!